The Microsoft Imagine Cup is an international student technology competition that gathers young developers from around the world who come together to compete by building technology-based solutions to solve challenging problems. This year’s competition took place in Sydney, Australia, and Algeria was represented by The Klein Team who made it to the top 3 in the Windows Azure Challenge with their software solution for diabetes management. Inspire Magazine caught up with Amine Bounoughaz, a member of the Klein Team, to talk about their innovative application and inspiring experience. Amine Bounoughaz: My name is Amine Bounoughaz, I recently graduated with an Electrical Engineering degree from the National Institute for Electricity and Electronics (ex INELEC). The Klein Team started off with three members which include myself, Tahar Zanouda, who is a 4th year Computer Science student at L’École National Supérieure d’Informatique (ESI, ex INI), and Amine Aboura, who is a 5th year Computer Science student at Chlef University. We come from different universities and schools but also from different regions of the country (Biskra, Boumerdes and Chlef). IM: How did this team come together to compete in Imagine Cup 2012? What motivated you to take part in this competition? And why the “Klein” team? AB: It’s an interesting story actually. Tahar and I first met during the course of the Imagine Cup 2010 local finals in Algiers where we were competing in different teams. We kept in touch and later on met again at different technology events. It was through Tahar that I met Amine Aboura, who was already a Microsoft Student Partner. Later on, I was selected to be a Microsoft Student Partner as well and so we kept meeting on different occasions, delivering presentations and even working together on cool projects like building phone applications to control robots. Working together was really great since we shared the same passion for technology and complemented each other’s skills. Another interesting aspect of our team is that we already had international experiences. 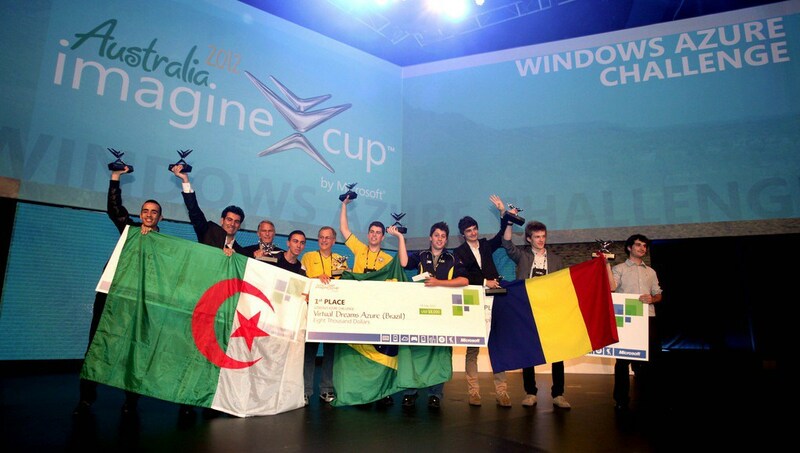 Amine Aboura had already attended the Microsoft Imagine Cup worldwide finals in New York in 2011, Tahar had studied social entrepreneurship at Connecticut University while I studied leadership at Georgetown University during the summer of 2010. So we knew we had potential and we were not intimidated by competing at an international level. As for the name of the team, “Klein” is actually inspired from the Klein bottle, which is a mathematical surface in the form of a small bottle that has the unique property of having no boundaries and an infinite surface. This was the message that we wanted to convey by choosing this name: an infinite amount of creativity, energy and potential. IM: How do you feel about winning this prize and becoming the top three worldwide in your category of competition? AB: When you believe in something and work really hard for it, when you come across lots of challenges and difficulties and overcome them and in the end all your hard work and perseverance pays off, it’s simply amazing. Being there with the best and brightest young minds, then winning a spot on the podium and raising the Algerian flag high for the very first time at such a competition was a lifetime honour. We were obviously really happy and proud of what we had accomplished, but what made us even more proud is the echo and impact that our achievement generated within the Algerian youth sphere. We found out that we are inspiring young Algerians to believe in themselves and their abilities to achieve great things, we received lots of messages and emails from people we didn’t even know who thanked us for restoring faith in their potential. We were really humbled and thankful for all the messages we received, which will definitely help us keep moving forward and hopefully achieve more inchAllah. IM: Could you tell us about the application that you developed which won you the 3rd place at Imagine Cup 2012 Windows Azure Challenge? A tool to automatically transfer their glucometer readings onto the cloud. A reminder to take their medication/insulin and to measure their blood sugar. Daily tips and recommendations on how to live with diabetes, what to eat, etc., which are generated according to the patient’s current status. A community space where users can exchange their experiences and interact with patients and healthcare professionals. A DiaPedia that intelligently filters content on the internet and offers patients a selection of articles, news and blog feeds that could potentially be of interest to them. DiaLife also provides interesting features for caregivers/doctors to allow them to follow the medical status of their diabetic patients in real time, interact with patients through their DiaWall, and to receive SMS notification in case of critical blood sugar readings. The application can be easily accessed using any tablet or phone through its web interface and it’s available on Windows Phone and will soon be available on Android and iOS. IM: So how did you come up with the idea for this application? And what was the implementation process like? E.g. Did you do any particular research to drive the design process? AB: It was Tahar’s idea since his parents have been struggling with diabetes for a long time. He thought about creating a solution that would facilitate diabetes management. We then started building on and develop the idea together. We first had to properly understand the disease and how it affects patients’ everyday life and so we went to hospitals and interviewed patients. We interviewed men, women, kids, patients and caregivers and were truly touched by how open and honest they were about talking about their struggle; I think this was actually one of the crucial factors that made us feel emotionally connected and devoted to this project and that kept us going and pushed us to work harder. We are really grateful for all these people who inspired us to conceive DiaLife and more grateful to Beni Messous hospital for facilitating the process of meeting and talking with diabetic patients. The implementation itself was a pretty systematic process. After agreeing on the main idea – that is a solution to facilitate living with diabetes – we proceeded to gathering information about the topic. We learnt about diabetes from books, magazines, reviews and most importantly from people who suffered from the disease. We then looked into current diabetes management solutions and tried to use them as a diabetic patient. Most of the applications tended to be too complicated, almost like they were designed to be used by robots rather than by human beings. They didn’t inspire that feeling of safety and certainly did not seem to encourage the patient to come back to using the application again. We wanted to create a space where diabetic patients felt they belonged. Using Cloud Computing in healthcare systems is a fairly new area, so there were only few resources available and consisted of recent papers that discuss the power of the cloud architectures in disease management. Overall, it took us about five months to finalize the first prototype before submitting it for the Imagine Cup competition, and we are still working on improving our prototype before going to beta-testing and eventually releasing it on the market. IM: How does your application compare to existing solution for helping patients with diabetes and their caregivers? And how do you think people could benefit from your application in the long run? AB: I think what sets DiaLife apart is its interface and ease of use. We have thought of diabetic patients and their needs all along the process, which led us to develop a very simple and intuitive solution. We always saw DiaLife as more of a space designed to make diabetic patients feel better about themselves and their condition. Whether you just found out that you had diabetes or you’ve been under insulin for 20 years, DiaLife aims to simplify things for you. Other diabetes management solutions tend to focus more on the disease itself and neglect the human aspect, and so you end up with lots of complicated charts and menus that drive the patient away from the application. DiaLife puts people first. IM: What are your future plans for this application? AB: Elhamdoulilah, we were blessed with the Imagine Cup experience that allowed us to prove ourselves and our skills. We are now looking at turning our project into a start-up. We have already received some offers of investment and we are looking at the best and most suitable options for our project to prosper. We are constantly working on ideas to improve our prototype, and we now have a roadmap to finalize the project and release it into the market. We are also really happy to be adding a new Kleiner to the team, Aymen Daoudi, who is a distinguished developer and a valuable addition to the team. IM: How about your own personal plans, what’s next for the Klein Team? And where do you see yourselves in the future? AB: The Klein Team is not just about DiaLife, it’s a group of aspiring young tech-entrepreneurs who want to see entrepreneurship prosper and develop in Algeria. DiaLife will hopefully be our first step into the world of entrepreneurship and inchAllah there will be more to come in the future. IM: Many thanks for speaking to Inspire Magazine and all the best for your future endeavours. AB: Thank you, and in turn I would like to congratulate you and the Inspire Magazine team for this great initiative that will definitely help highlight the Algerian talents everywhere. We are really humbled and honoured to be featured on your magazine.